The Council of the Innu of Pessamit and Resolute signed a collaboration agreement to promote economic development for the First Nation and Resolute’s North Shore operations. Signed on June 3, 2015 in Pessamit, the agreement, titled, A Balance Between the Protection of Nitassinan and Economic Development, provides mainly for the recruitment, training and hiring of Innu labor. Over the short and medium terms, members of the Pessamit community could benefit from dozens of job opportunities at Resolute operations. 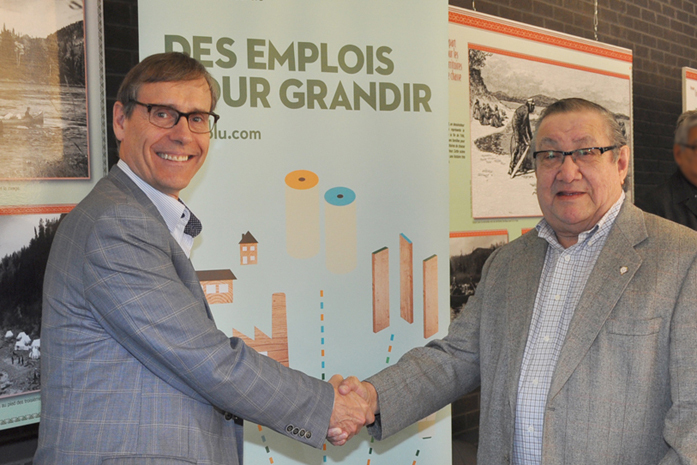 The agreement also provides for investment in Innu businesses in the forest, biofuel and wildlife industries. Resolute benefits from a timber supply guarantee applicable to the North Shore administrative region. In the event of a spruce budworm epidemic affecting a large portion of the Nitassinan in Pessamit, a harvest would allow for forest renewal, while simultaneously making use of a resource which would otherwise be lost. Current harvest plans also already respect critical woodland caribou habitats through the establishment of large conservation areas for at least 70 years. Pessamit and Resolute will collaborate on implementing appropriate solutions which take into account the needs of woodland caribou, as well as community interests.